The Food Collection 2 in 1 Hand Blender is the perfect choice for those of you out there that are new to cooking and want to explore a world of flavours and foods. In a clean ice white against a glossy midnight black it will blend in to any kitchen and bring ease to your cooking routine. This versatile appliance can have you chopping up ingredients for a hearty bolognese one minute and blending up dips for a dinner party the next. The Food Collection 2 in 1 Hand Blender is the perfect appliance for those of you that need a little help in the kitchen but still want the hands on approach. 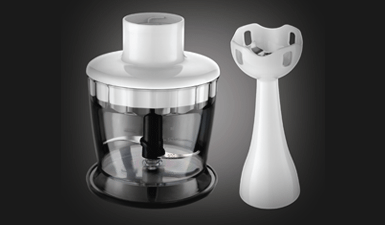 The 2 in 1 Hand Blender has a detachable plastic blending leg that can be easily removed. Designed to make your washing up routine easier, you can remove the leg to effortlessly clean the blades. And that’s not the only benefit, if you’re lacking in kitchen space you can always detach the parts and place them into a spare cupboard or drawer to keep your kitchen clutter free.